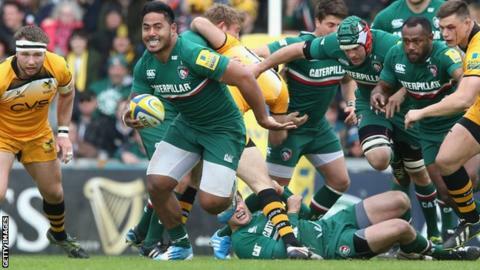 England centre Manu Tuilagi scored twice as Leicester left it late to secure a bonus-point Premiership win against London Wasps. Tigers led 14-10 at half-time through tries from Tuilagi and Vereniki Goneva, with Guy Thompson crossing for Wasps. Tuilagi added his second after the break and Owen Williams kicked a penalty to extend the lead. Wasps struck back through full-back Tommy Bell, but the Tigers sealed the win with a late David Mele try. Leicester went into the game knowing that they required a bonus-point win if they were to stand a realistic chance of securing a home semi-final in the play-offs and they started in an uncharacteristically nervous way in front of the Welford Road faithful. Their opponents, who are chasing a European Cup spot, also needed the points and they scored first with former Tigers fly-half Andy Goode slotting an early penalty. The last 10 Premiership matches between the two clubs have all been won by the home side on the day. Wasps last victory at Welford Road came on September 26, 2008. His opposite number, Williams, missed a shot at goal before the hosts got on the board through Tuilagi, who crashed over after taking a flat pass from his England colleague Ben Youngs. Williams added the extras. The visitors were held up over the Leicester line and five minutes later they got their reward when flanker Thompson took a pass from Ed Jackson to sprint down the left touchline to cross, Goode converting. The Tigers were unable to take control of the game and made several unforced errors, but they wrestled back the lead on the stroke of half-time when Goneva, swapped passes with Matthew Tait to go over in the corner for his 10th Premiership try of the season. Tuilagi's power was proving too much for Wasps to handle and he burst through again to score his team's third try with half an hour remaining. Williams slotted a penalty to extend the lead to 12, but Bell gathered a neat chip from centre Elliot Daly to reduce the deficit with 10 minutes remaining. However, it was the home side who extended their unbeaten run in the Premiership to nine matches when replacement scrum-half Mele darted over following good work from the pack. The win moves Leicester to within two points of second-placed Northampton Saints, who visit table-topping Saracens on Sunday. Wasps have now only won once in their last seven Premiership outings and risk missing out on the top seven place that would give them the chance of playing in the new-look European Cup next season. "With Goneva, Tuilagi and Mulipola and some of the guys we are bringing in for next season we will have a very physical team, and that is what you need at the top end. "Job done, we will take maximum points, which is pleasing, but it was a bit of a non-event. "Quins next week is a big game, we have got a nine-point cushion on them but we have still not qualified for the semi-finals, we are not home and dry. "We have put a bit of pressure on Northampton but they are still in the box seat for a home semi-final, we have to keep winning and see what comes." "We were right in the game until the end. I thought we frustrated Leicester for large parts of the game, but we let it slip away from us. "We are disappointed we did not get a losing bonus point. Leicester Tigers: Tait; Goneva, Smith, Tuilagi, Scully; Williams, B. Youngs; Stankovich, T. Youngs, Balmain, Slater (capt), Kitchener, Gibson, Salvi, Crane. Replacements: Hawkins for T Youngs (62), Ayerza for Stankovich (46), Mulipola for Balmain (46), Balmain for Mulipola (60) Parling for Kitchener (62), Matera for Crane (70), Mele for B Youngs (56), Flood for Smith (56), Morris for Tait (73). Wasps: T. Bell; Short, C. Bell (capt), Hayter, Helu; Goode, Davies; Mullan, Lindsay, Swainston, Cannon, Palmer, Jackson, Thompson, Hughes. Replacements: Festuccia for Lindsay (12-18 blood rep & 40), McIntyre for Swainston (64), Reeves for Mullan (60), Launchbury for Palmer (60), Jones for Hughes (62), Sheehan for Davies (60), Carlisle for Goode (58), Daly for Hayter (64).